Added A5914, B1, BY8415, SK2059, Y15399.2/Z34332.2, Y18635, Z21341.2, BY14350, BY14352, BY14353, BY14354, BY14355, BY14356, Y14357, BY14358, BY14362, BY14363, BY14364, BY14365, BY14366, BY14367, BY14368, BY14369, BY14370, BY14371, BY14373, BY14374, BY14376, BY14377, BY14383, BY14384 to tree on 27 January 2017.
to tree on 28 January 2017. Added BY14582, BY14584, BY14587, Y23412, PH1578, PH2467, PH3402, PH3982, PH4629, SK2055, BY14756, BY14589 to tree on 29 January 2017. Added CTS1124, CTS12001, CTS3187, CTS3719, CTS6460, CTS6666, CTS6941, CTS8029, CTS8151, CTS8359, CTS8750, CTS10490, CTS10954, V1664, V4167, ZS11771, CTS5330, CTS6189, CTS7124, CTS1647 to tree; added PF4354 to tree investigation on 23 February 2017. Added BY15332, BY15333, BY15334, BY15335, BY15336, BY15337, BY15338, BY15339, BY15342, BY14343, BY15344, BY15345, BY15348, BY15350, BY15351, BY15352, BY15353, BY15354, BY15355, BY15356, BY15357, BY15358, BY15360, BY15361, BY15363, BY15366, BY15367, BY15368, BY15369, BY15370, BY15371, BY15372, BY15373, BY15375, BY15381, BY15389, BY15390, BY15391 to tree on 24 February 2017. Moved existing tree or investigational mutations S461/Z290, S245/Z245, Z260 to just above L21 to reflect new testing on 3 March 2017. Added A14362/S3511, BY13049, Y13199, Y13200, Y13202, Y13203, Y13204, Y13205, Y13206, Y13208, Y13200, Y13210, Y13872, Y13873, Y13874, Y13875, Y13878, Y13879, Y13881, Y13882, Y13883, Y13884, Y13885, Y13886, Y13887, Y13888, Y14187, SK2080/Y13876, Y13201, Y13207, Y13877, Y13889, L1432, L1433, Y14051, Y14052, Y14053, Y14054, Y14055, Y14056, Y14057, Y14058, Y14059, Y14060, Y14061, Y14062, Y14159, Y14160, Y14161, Y14162, Y14163, Y14164, Y14165, Y14166, Y14167, Y14168, Y14169, Y14170, Y14172, Y14173, Y14174, Y14175, Y14176, Y14177, Y14178, Y14179, Y14180, Y14181, Y14182, Y14183, Y14184, Y14185, Y14186, Y14188, Y14189, Y14190, Y14191, Y20750, BY13052, BY13053, BY13054, Y20751, Y20752, Y20753, Y20754, Y20757, Y20759, Y20760, Y20761, Y20762, Y20763, Y20766, Y20768, Y20769, Y20771, Y20772, Y20773, Y20775, Y20776, Y20777, Y20779, Y20780, Y20781, Y20782, Y20783, Y22570, Y20747, BY13064, FGC40109/Y20778, Y20755, Y20756, Y20758, Y20765, Y20767, Y20770, Y20774, Y20784, Y22195, Y22196, BY15590, BY15591, BY15592, BY15593, BY15594, BY15596, BY15598, BY15599, BY15600, BY15601, BY15602, BY15603, BY15604, BY15605, BY15606, BY15607, BY15608, BY15609, BY15610, BY15611, BY15612, BY15613, BY15614, BY15615, BY15616, BY15618, BY15619, BY15620, L1435 to tree; added SK2081 to tree investigation on 4 March 2017. Added FGC5780/Y9367, BY3384, RC5 to tree on 9 March 2017. Added BY9595, BY9596, BY9597 to tree on 10 March 2017. Added FGC5769/Y9364, FGC5779/Y9066, FGC5783/Y9068, FGC5766/Y9061, FGC5782, FGC5760/Y9059, FGC5767/Y9062, F15489/Z4300, FGC15493, FGC15494, FGC15495, BY9598, BY11494, BY11496 to tree on 15 March 2017. Added L1448 to tree on 20 March 2017. Added FGC15499, FGC15500, Z30233 to tree on 21 March 2017. Added S6189/ZS608, FGC33201, S6168, S6191, S7211, S6185, S7209 to tree on 22 March 2017. Added A5409, A5410, BY3455, BY4116, BY4127, A418, A419, BY4132, BY4133, BY4134 to tree on 23 March 2017. Added BY3364, BY3666, BY3367, BY12309, BY12310, BY12312 to tree on 24 March 2017. Added Z16532, Z16526, ZZ1, S5459, S6166, S7133, Z29558, BY3736, BY3737, Y20358, BY3300 to tree on 30 March 2017. Added FGC20963/V3544, FGC20972/Y8457, FGC20975/Y7782, FGC20978/Y8455, FGC20982/V3923 to tree on 31 March 2017. Added FGC20996/Y7772, FGC20999/SK2064/Y7778, FGC21000/Y7780, FGC21012/V2219, FGC21020/Y8456, FGC21051/Y8448, FGC21057/Y7776, FGC21059/Y7781, PF6287, PF6289, PF6290, PF6291, PF6292, PF6299, PF6301, PF6304, PF6307, PF6309, PF6310, PF6311, PF6312, PF6313, PF6314, PF6321/V4036, PF6323, PF6324, PF6327, PF6328, PF6330, PF6332, PF6333, PF6338, PF6339, PF6341, PF6343, PF6344, PF6376, S5025/Z2174, Y7770/Z30230, PF6319, PF6331, PF6337 to tree on 8 April 2017. Added PF6346, PF6348, PF6351, PF6352, PF6358, PF6359, PF6361, PG6365, PG6366, PG6368, PF6370, PF6372, PF6374, PF6375, PF6378, PF6379, PF6380, YP5453, YP5454, Z30298, Z30299, Z30304, Z30305, Z30307, Z30308, FGC21014/SK2065/Y7777, FGC21015/V3608, FGC21056/Y7775, FGC21034/SK2063/V2197, FGC20971/Y8451, FGC20991/Y8446, FGC20992/V1732, FGC21010/Y8449, FGC21011/Y7783, FGC21013/Y7787, FGC21027/Y8462, FGC21029/Y8453, FGC21030/Z30279/Y7773, FGC21041/V1227, FGC21063/Y7784, SK2066, SK2068, SK2069, Z30249, Z30255, Z30272 to tree on 10 April 2017. Added FGC20970/Y8447, FGC20998/Y8458, SK2071/V1944, FGC39697/V1589, FGC39713/V3599, Y7771, Y7779, Y7788, Y7790, Y8435, Y8436, Y8439, Y8440, Y8441, Y8443, FGC39700/Y17711, FGC39725, Y17712, Y21722, FGC39691, FGC39692, FGC39693, FGC39694 to tree on 11 April 2017. Added FGC39695, FGC39696, FGC39698, FGC39699, FGC39701, FGC39702, FGC39704, FGC39705, FGC39706, FGC39708, FGC39709, FGC39710, FGC39711, FGC39712, FGC39714, FGC39715, FGC39716, FGC39717, FGC39718, FGC39719, FGC39723, FGC39724, Y20962, Y21720, Y21723, Y21724, Y24708, Y24709, Y24710, Y24711, Y24712, FGC42146/V3181, Y18458, Y18459, Y18460, Y18461, Y18462, Y18463, Y18464, Y18862, Y18863, Y18864, Y18865, Y18866, Y18867, Y18868, Y18869, Y18870, Y18871, Y18872, Y18873, Y18874, Y18875, , FGC20974, FGC20977, FGC20986, FGC20988, FGC20989, FGC20994, FGC20995, FGC20997, FGC21003, FGC21006, FGC21007, FGC21019, FGC21022, FGC21024, FGC21025, FGC21026, FGC21032, FGC21037, FGC21038, FGC21039, FGC21040, FGC21042, FGC21043, FGC21044, FGC21052, Y17183, FGC20980, FGC20962, FGC20964, FGC20966, FGC20967 to tree on 12 April 2017. Added FGC20987, FGC21001, FGC21002, FGC21004, FGC21008, FGC21016, FGC21021, FGC21023, FGC21031, FGC21035, FGC21062, FGC21047, FGC2151304401049, FGC21053, FGC21055, FGC21065, FGC21060, FGC30489, S10807, Z16297, Z16299, Z16300, Z16302, Z16303, Z16304, Z16306, Z16307, Z16310, Z16312, Z16313, Z16315, Z16317, Z16318, Z16320, Z16321, BY1111, Z16305, Z16308, Z16309, Z16311, Z16314, Z16319, S6003, Z16541, FGC43486, FGC43491, S6018, S6019, S6024, S7190, Z17560, Z17562, Z17564, Z17558, Z17559, Z17561, Z17563 to tree on 13 April 2017. Added Y23529, BY11112/Y23533, BY11113/Y23206, BY11114/Y23530, BY11120/Y23534, CTS10855, Y23531, Y23532, Y23535, BY635/Z29593, BY636/Z29594, BY637/Z29596, BY638/Z29597, BY639/Z29598, BY640/Z29599, BY641/Z29601, BY642/Z29602, BY643/Z29603, BY644/Z29604, BY646/Z29606, FGC33971, FGC33972, FGC33973/Z39680, FGC33974, FGC33060/Y15094, BY11117/FGC33056, BY13009, BY13010, FGC33039 to tree on 14 April 2017. Added FGC33041/Y15088, FGC33045, FGC33047/Y15090, FGC33049, FGC33052/Y15091, FGC33053, FGC33055, FGC33057, FGC33058/Y15092, FGC33059/Y15093, FGC33062, FGC33063, FGC33066/Y15095, FGC33067, FGC33068/Y15096, FGC33069/Y15097, FGC33070, Y15500 to tree on 15 April 2017. Added BY3363 to tree on 20 April 2017. Added FGC13201, A692, FGC13210, FGC13211, BY14642, Y28598, Y28599, Y28600, Y28602, Y28603, Y29458, Y29459, Y29461, Y29462, Y29463,Y28589, Y28591, Y28594, Y28595, Y28641, Y28642, Y28643, Y28644, Y28646, Y28647, Y28648, Y28650, Y28651, Y29404, Y29404, Y29406, Y29407, BY14309, FGC51802, FGC51793 to tree on 24 April 2017. Added Y17455, Z16292, Z16293, Z16282, Z16286, Z16288, Z16290, Z16291, Y17454, Z16284, BY3301, M7964.2, Z29611, FGC63585, FGC63586, BY4011, BY4012, BY4005, BY4006, BY4007, BY4009, BY4010, BY3302, BY3829, BY3303, A14023, A14024, BY12084/FGC58890/Y28681 to tree on 25 April 2017. Added FGC11358, FGC11317, FGC11320, FGC11321, FGC11322, FGC11324, FGC11327, FGC11329, FGC11334, FGC11337, PF5374.2, Z17567, FGC11338, FGC11339, FGC11343, FGC11344, FGC11345, FGC11349, FGC11361, FGC11336, FGC11361, A933, A934, A936, A935, A932 to tree on 27 April 2017. Added FGC11340, FGC11353, A6484, A6485. A6486. A6487, A6488, A6489, A6490, A6492, Z6494, A6495, A6496, A6498, A6499, A6500, A6501, A6502, A6503, BY8978, CTS11522, BY8982, BY8981, BY8980, BY12129, BY12130, BY12131 to tree on 28 April 2017. Added BY3348, BY3350, BY3352, BY3353, BY3357, BY3359, BY2198, GG439, FGC31927/GG428, FGC31931/GG483/V2381, BY856/GG490/Y19696, GG572/PH1631/V2850, BY1713/FGC31957/GG731/Z29759, BY2098/FGC31966/GG815/Z29761, PH1348, GG480/V2347 , Y31335, BY16680, A11710, A11711, A11712, A11713, A11714, A11715, A11717, A11718, A11719, A11720, A11721, A11722, A11724, A11725, B419.2, BY16686, BY16688, Z22683.2, A15807, BY16684, A15808, BY16698, BY16699, A15809, BY16690, BY16691, BY16692, BY16693, BY16694, BY16695, BY16696, Z29758, GG719/Z29764, PF7566, PF7569, Z29785, Z29786, Z29805, GG700/Z29766, V3286/Z29774, S15929, V3360/Z29777, V3870/Z29776, Y21234, Y21238, Z29765, Z29767, Z29769, Z29770, Z29771, Z29778, Z29779, Z29782 to tree on 2 May 2017. Added GG445, GG460, GG466, GG534, GG560, GG573, GG597, GG600, GG629, GG644, GG669, GG674, GG709, GG729, GG745, GG746, GG764, GG831, GG843.2/ZS6986.2, FGC42003, FGC42006, FGC42011, FGC42013, FGC42029, FGC42030, FGC42031, FGC42034, Y31465, Y31466, Y31467, Y31468, Y31469, Y32037, Y32038, Y32039, Y32040, Y32041, PH2558, V3789, PH4238, FGC31923, BY16685, FGC31929, FGC31933, FGC31939, FGC31942, FGC31944, FGC31947, FGC31954, FGC31956, FGC31960, FGC31961 to tree on 3 May 2017. Made some investigational items previously equivalentt to A98 a new subgroup under A98; changed 5 subgroups under Z39589 from investigational to confirmed; changed 2 subgroups under ZZ10 from investigational to confirmed; added A7905, A7906, A7907, A7911, A7919, BY1189Y267494 to tree on 9 May 2017. Added S19938, BY18887, BY18888, BY18889, BY18890, BY18891, BY11892 to tree on 10 May 2017. Added Y18209, Y18210, Y18211, Y18212, Y18213, Z44612, A9063, ZZ38 to tree on 12 May 2017. Added FGC43483 to tree on 19 May 2017. Added A7302, A11314, A11311, A7304 to tree investigation on 21 May 2017. Added FGC11355, BY15552, BY15553, BY15554/FGC32648, BY15556/FGC32655, RC6 to tree on 1 June 2017. Added FGC61810, FGC61811 to tree on 2 June 2017. Added FGC42958, FGC42959, FGC42960, FGX42961, FGC42962, FGC42964, FGC42966, FGC42967, FGC42968, FGC42969, FGC42970, FGC42971, FGC42973, FGC42974, FGC42975, FGC42977, FGC42978, FGC42979, FGC42981, FGC55499, FGC55504, FGC55505, FGC55509, FGC60582 to tree on 8 June 2017. Added FGC23396, FGC23382 to tree on 14 June 2017. Added BY19855, BY19856, BY19857, BY19858 to tree on 15 June 2107. Added BY20009, BY20010, A14025, A14026, A14027, A14028, FGC34092, FGC34096, FGC34097, FGC34098 to tree on 23 June 2017. Added Z17557, A14029/BY20290, BY20276/Y30763, BY20289/Y30762 to tree on 26 June 2017. Added FGC32830 to tree investigation; added BY20361 to tree on 30 June 2017. Added FGC12577/Y3370, FGC12642/Y3434, FGC12732/Y3312, FGC12735/Y3371, FGC22615/Y3546, BY21669, Y34210, FGC50249, FGC50284, FGC50291, FGC50294, FGC50303, FGC50314, FGC50342, FGC50343, FGC50375, Y35004 to tree on 26 August 2017. Added Z36747, FGC3197, FGC3200, FGC3212, Y2261/Z16447, Y2262/Z16448, Z723, Z724 to tree on 25 September 2017. Moved Z2245, Z2246 from investigation to tree; added V1864, Z2247, Z2248, CTS11638 to tree on 26 September 2017. Added S180 to tree investigation on 24 October 2017. Added FGC58881, FGC58882, FGC58883, FGC58886, FGC58887, FGC58888, FGC58892, FGC58895, FGC58896, FGC58898, FGC58899, FGC58904, FGC58907 to tree on 3 November 2017. Added FGC5572/Y8426 to tree on 4 November 2017. Broke out A874 separate from A875 and A876 based on new testing on 15 November 2017. Added BY30490, BY30491 to tree on 6 December 2017. Added BY30496 to tree on 7 December 2017. Added FGC34101 to tree on 8 December 2017. Added FGC42109 to tree on 19 December 2017. Added V1640, BY23092, BY32354 to tree on 24 December 2017. 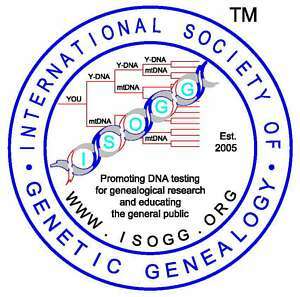 Copyright 2017, International Society of Genetic Genealogy. All Rights Reserved.